If there's one thing I'm mildly obsessed with, it's children's books. As a child, my mom instilled in me a love of the library, charming tales and beautifully-illustrated pages, and I have so many memories of reading our favorite picks over and over and over with her and my sisters. I'm happy to also be raising readers within my own home, and the girls and I make it to the library at least twice a week these days. Along with the many (possibly too many) books we own, we like to have a steady rotation of library books sitting in the basket by our fireplace. Even if I set a limit for us during a visit ("Okay, let's get only six books today.") we will literally never stick to the limit ("Mom, you know we always get more than we think."). Yes, I'm usually the culprit, throwing in several more books I find as we head to check out. Have I mentioned that I have a life goal of one day working at a library? True story. In any case, there always seem to be some particularly beautiful, well-written and captivating picture books I come across every month, and I've been wanting to find a place to share our favorites. 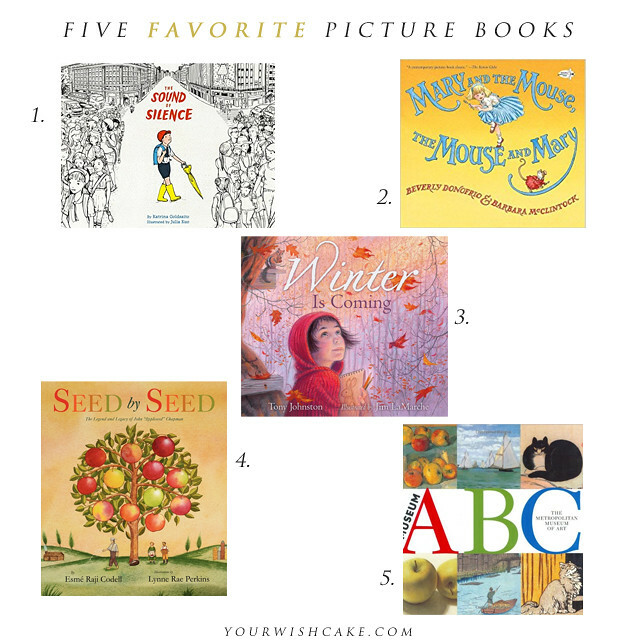 Here and there, I'll be sharing five of our current favorite picture books with you here on the blog, and the ones I choose will always be those I feel are worthy of at the very least checking out from your own local library—but also worthy of gifting to a book-loving child you know. (Books, after all, are the best gifts. Amen.) Although we are picky with the books we actually purchase (I typically only buy books from used book sales or thrift stores, and purchase new books for birthdays or Christmas), there are so many I come across lately that I would love to add to our personal library. Here are a handful that we've enjoyed within the last few weeks! 1. 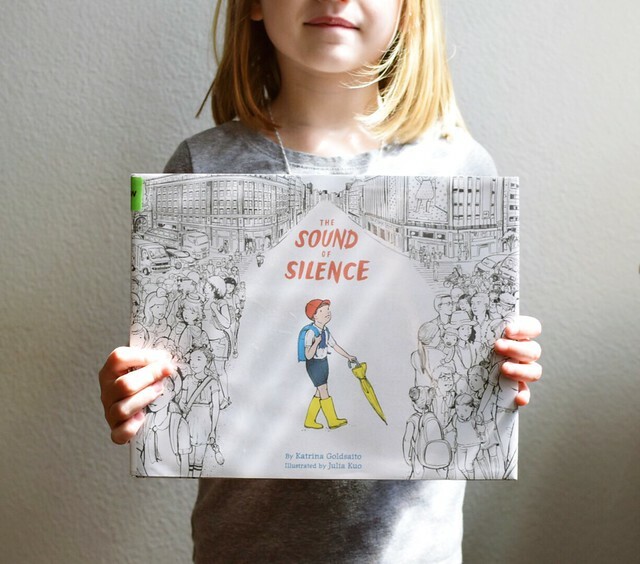 The Sound of Silence by Katrina Goldsaito — The illustrations are what made me want to pick up this book, and the story ended up being just as sweet. This book follows a boy around the bustling city of Tokyo as he learns about and searches for ma, which is the Japanese word for the pause, or silence, between other noises. Such a good read-aloud! 2. Mary and the Mouse, The Mouse and Mary by Beverly Donofrio — I pretty much want to live inside the world this illustrator, Barbara McClintock, creates. (She also wrote and illustrated a couple books about a french boy and girl, Adele & Simon, which are part storybook, part look-and-find, and we absolutely loved them.) This book shares a multi-generational story of a girl and a mouse who share the same house. Eisley loved seeing the similarities between the illustrations of the girl's life and the mouse's life. 3. Winter is Coming by Tony Johnston — It was a bummer to read a crisp, autumnal book like this when Southern California heat was hovering around 95 degrees, but alas! This story follows a girl who is observing nature from her favorite spot in a tree in a forest near her home. She has a nature journal and sketches the creatures around her (which I personally love, because this is our first year using nature journaling as a part of our schooling). It's one of those picture books that teach children things about nature and the world around them without feeling like your average non-fiction book. It is a winner, for sure. And if you haven't seen the other books from author/illustrator Jim LaMarche, you are missing out! 4. Seed by Seed: The Legend and Legacy of Johnny "Appleseed" Chapman by Esme Raji Codell — Apparently I knew little to nothing about the real Johnny Appleseed, but after reading this book, Eisley and I now have a better grasp on the reality behind the Tall Tale. Aside from the incredible illustrations, I loved how the story was presented in a way that draws modern children into a very different time. I know many people are studying apples and such in September, so this would be a good one to add to the library stack this month! 5. Museum ABC by The NY Metropolitan Museum of Art — As anyone knows, there is an endless selection of ABC books for toddlers and children. But this one is definitely on my list of ones to add to our own library (and to use as a gift for other little ones in my life!). Each letter features four works of art pertaining to a specific word. For instance, "C" is for "cat" and shows four images of cats from four very different pieces of artwork. Cora adored this book and I love that even a toddler can be introduced to some incredible artwork in this way. As always, I am on the lookout for new books to read with my daughters—so be sure to leave any current favorites of your own within the comments! Oh I love these! Always looking for new books to check out from the library, thanks for sharing.